The University of Kentucky didn’t get a win against Georgia, but you still might consider it a recruiting win. Countless recruits witnessed a packed Kroger Field for the SEC East showdown. Many shared their experience on social media after the game. The biggest name on the guest list might have also been the biggest person in the stands. Justin Rogers, a five-star Michigan offensive lineman in the 2020 class, shared this snapshot from his trip. Dylan Rathcke is a pretty big guy too. One of Kentucky’s top remaining offensive tackle targets in the 2019 class, the Baton Rouge native made his first trip to Lexington. Arkansas is believed to be UK’s top competition for the three-star prospect. The name we’ll probably be talking about most in the upcoming 2020 class is Vito Tisdale. The Bowling Green High School safety is considered the No. 5 safety in the 2020 class and a Top 150 player in America. Already a four-star prospect, Tisdale holds offers from Oklahoma, Alabama, Tennessee and of course, Kentucky. William Griffin, a 6’5″ sophomore offensive tackle from Nashville, Tennessee, picked up an offer on the visit. Kentucky also extended an offer to someone who has family ties to Kentucky. Randall Cobb’s nephew, Tee Hodge, is a three-star 2020 running back form Maryville, Tennessee who now holds a UK offer. Hodge wasn’t the only 2020 running back in the building. Georgia’s Aalijah King was in the Bluegrass, as was Illinois’ J.M. Etienne. I do not know if he’s related to Clemson’s Etienne (probably not), but we’ll just say he is for the heck of it. 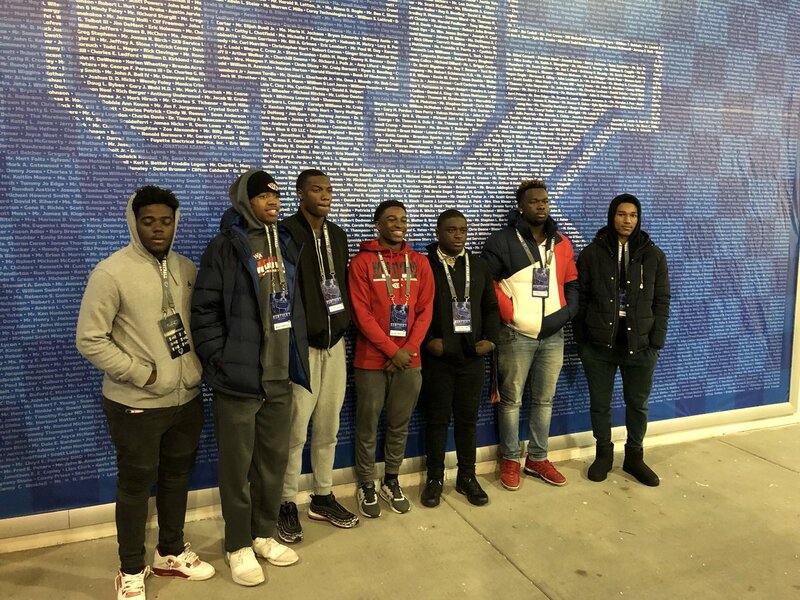 Georgia 2020 quarterback Mike Wright made the trip to UK with some of his Woodward Academy teammates. Illinois track star Marcellus Moore is being recruited as a wide receiver. The three-star 2020 prospect does not yet have an offer from Kentucky. Wes Hine is one big dude in the 2020 class from Springfield, Illinois. Devyn Curtis is a three-star inside linebacker in the 2020 class from Brentwood, Tennessee. Traevon Williams, a 2020 offensive tackle from St. Louis, already has six offers from power five schools in the Midwest. A pair of teammates from Dorian Baker’s alma mater, Cleveland Heights High School, stood on the sideline before the game, 2020 defensive end Justin Wodtly and 2019 cornerback Josh Harris. 2020 Douglasville, Georgia defensive end Bradyn Swinson made an unofficial visit. Justin Bromagen, a 2020 Ohio offensive tackle, already has a UK sweatshirt in his closet.